The Boat is a 17' 4" long Tracker grizzly all weld jon boat. It has been framed and skinned with aluminum so it is windproof and waterproof. 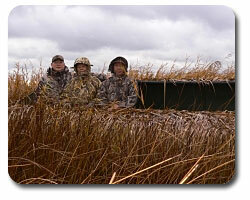 There is room to hunt 4 people out of it and it is heated and lighted for those cold dark mornings. 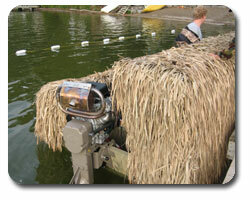 The motor is a 35 hp Mud Buddy that allows us to get into the weedy shallow bays that ducks love and traditional hunters can't access.